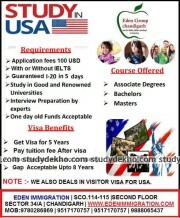 Global Voice is located at sector 34-A, Chandigarh. IELTS assesses the English skills of an individual in four parts that are, reading, writing, listening, and speaking. So, the institute provides training for interviews as well which helps a student to understand how to present themselves before the examiner. Global Voice is one of the most trusted places one can approach to fulfilling their desire and goals for settling abroad. Global Voice provides coaching for spoken English to beginners and learners. Their goal is to help their students become masters of the Language. The fee charged at the institute is very affordable. They help their students to become well versed with the pattern and the syllabus of the exam that is necessary to clear to get a seat in the top universities abroad. They have excellent teaching methods, helping the students to achieve their goals. They have special provision for the mock test for working professionals with proper discussion to help the students to analyze their weakness and work on them. Their experienced staff assists you during the entire process and provides guidance to build a better career. They have counselors that help students with all the legal formalities.